(HealthDay)—The U.S. Food and Drug Administration on Tuesday called for tougher warnings and "additional research" into a dye commonly used with standard MRIs. The dye—a "contrast agent"—contains a metal called gadolinium. It made news recently after claims from actor Chuck Norris that its use during MRI scans seriously affected his wife's brain. Contrast agents are injected into the body during an MRI scan to enhance image quality. In November, Norris and his wife, Gena, filed a lawsuit against several medical companies alleging she fell ill after exposure to gadolinium during MRI scans. The suit said Gena Norris was left weak, tired and suffering bouts of pain and burning sensations. 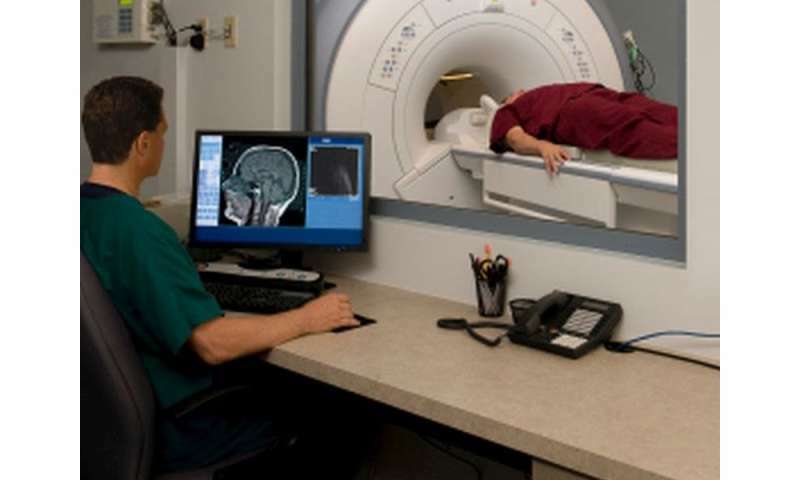 After reviewing available data, the FDA on Tuesday recommended that radiologists consider how much gadolinium might be left behind in a patient's body when selecting a gadolinium-based contrast agent [GBCA] for an MRI. The recommendation is especially important "for patients who may be at higher risk, such as those who may require repeat GBCA MRI scans to monitor a chronic condition," explained Dr. Janet Woodcock, director of the agency's Center for Drug Evaluation and Research. Patients who are sent for an MRI should also now receive a medication guide outlining issues surrounding gadolinium, Woodcock added. But for most patients, "gadolinium retention has not been directly linked to adverse health effects," the FDA stressed in an agency news release. It also said "the benefit of all approved GBCAs continues to outweigh any potential risks." For now, the FDA says gadolinium agents have only one known health risk: A "small subgroup" of kidney failure patients has developed a rare skin condition that causes a painful thickening of the skin. But gadolinium can linger in the body "for months or years after receiving the drug," the agency said, noting more research is warranted. It is asking manufacturers of GBCAs to "also conduct human and animal studies to further assess the safety of these contrast agents." This is not the agency's first warning on gadolinium. In September, an FDA panel called for a warning to be added to the agents' labels. The warning specifies that trace amounts of gadolinium may be retained in various organs, including the skin, bone and brain. The big question remains, though: What, if any, are the harms? Doctors have used gadolinium-based agents for 30 years—totaling more than 300 million doses, said Dr. Vikas Gulani. He's an associate professor of radiology at Case Western Reserve University in Cleveland. But, Gulani explained, researchers have only recently discovered that trace amounts of the metal can be left behind in the brain. One study on the issue was presented Nov. 29 at the annual meeting of the Radiological Society of North America. It involved nearly 4,300 older adults and found no evidence that gadolinium exposure was related to faster mental decline over several years, according to a team led by Dr. Robert McDonald, of the Mayo Clinic in Rochester, Minn.
"This study provides useful data that at the reasonable doses 95 percent of the population is likely to receive in their lifetime, there is no evidence at this point that gadolinium retention in the brain is associated with adverse clinical outcomes," McDonald said in a news release from the meeting. So, "at this point," Gulani said, "we are not aware of any harms from these agents being retained in the brain." Still, he added, the latest study does not rule out that possibility. There are open questions—including whether gadolinium exposure could be related to other neurological issues, such as movement problems. Also, any theoretical risks from the agents have to be balanced against their proven benefit in improving MRI image quality. However, there are cases where an MRI can be done without a contrast agent, Gulani said. "It's reasonable for patients to ask their doctor whether it's needed or not," he added. Gulani helped craft the latest recommendations from the International Society of Magnetic Resonance in Medicine on using MRI contrast agents. They say that if a gadolinium-based agent is not necessary, it should be skipped. "It's just like with any other medication," Gulani said. "If you don't need it, don't use it." The U.S. Food and Drug Administration has more on gadolinium-based contrast agents.